Getting information to people without outright annoying them can be a challenge, but Do-It literature holders can help you approach handing out info and deals in an engaging, non-invasive way. Compared to people shoving pamphlets in your face about the latest and greatest in products and sales, wouldn’t you rather be able to take in all that material at your own individual pace? People like to be in control of their lives, so take the next step towards giving them what they want with literature holders. No matter where you are thinking of putting a Do-It literature holder or what is going to go inside of it, Do-It has the kind you need. If you are a hotel looking to give out maps or event brochures for the town you are in for your guests, there’s a 3-way brochure box literature holder for you. 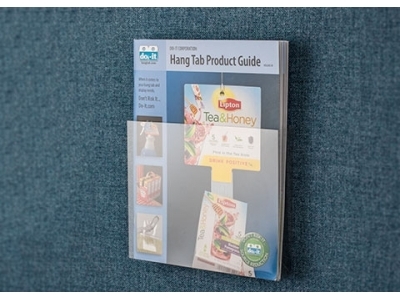 If you are a retail store looking to increase sales with enticing coupon pads or gift cards, the Do-It literature holder may even be mounted on the shelf with an adhesive strip to make sure customers are getting their best deal. All of Do-It’s literature holders ship flat with score lines for your convenience. With some simple folds, your literature holder is set up and ready to go. Ranging from 15 to 20 mil plastic, our literature holders are sturdy and will hold up to the long-term use that you need. Some may be hesitant to use literature holders from the plastic used to make them, but Do-It has an option for those who would like to try to create less waste. The economy option literature pocket uses 30% less material than our other literature holders, and because of this, it costs 30% less as well! No matter your needs, Do-It can help you to push information to clients in an approachable way with literature holders. Call today for more details or place an order!